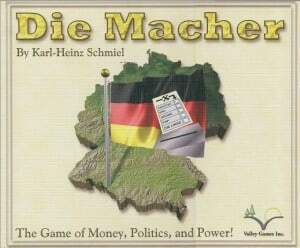 Die Macher is a game about 7 sequential regional elections. As a player, you are the leader of a major political party with certain policies that make up your political platform but you will have to decide which regions to focus on as you can’t win them all. Changing your platform may help to gain votes in one region but likely cause you to lose votes in another. As each election date approaches, more information is revealed from the polls which show how your party is doing in each region and you must react accordingly. The most important tool for all this is money, but cash is very limited and an election campaign is very expensive. Be careful not to spend all your money on one election as you will not have enough to outbid your opponents on the results of a public opinion poll that could be devastating to your campaign! Victory points are earned by winning regional elections, having control over the media, having a strong party membership and winning the national election. The player with the most victory points wins. Die Macher takes between 2 to 3 hours to play and has rules provided for a shorter 1 to 2 hour game. Rules are provided in English, German, Spanish, French, Italian and Dutch.